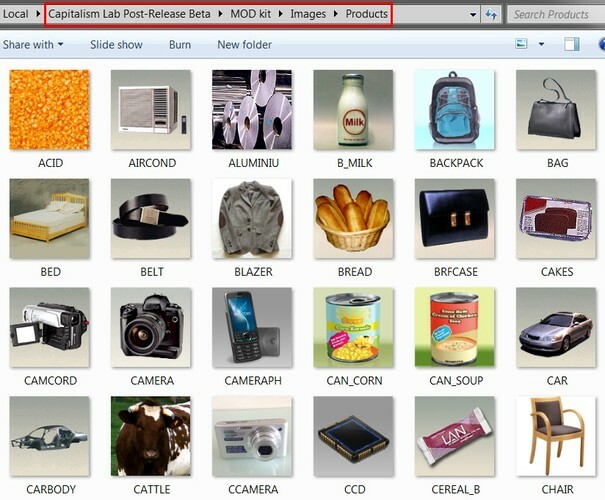 You will find the folder “MOD kit” under your Capitalism Lab folder. 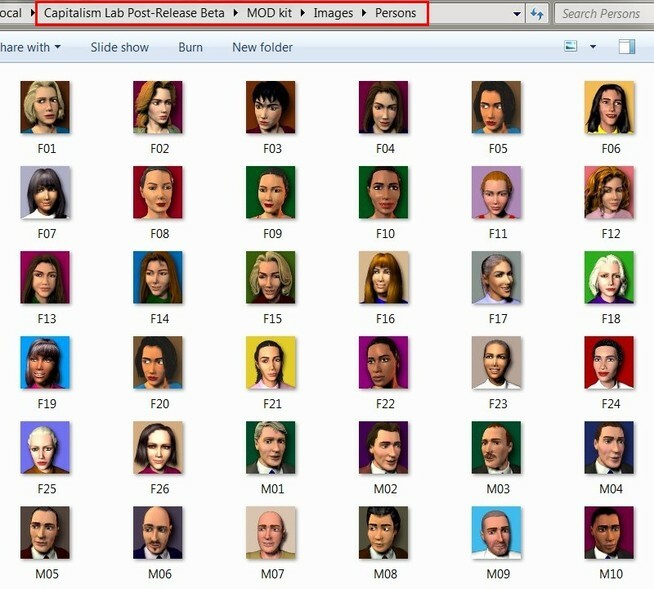 · The “Data” folder which contains moddable data files. · The “Images” folder which contains moddable image files. The data are in DBF format and can be edited using OpenOffice. OpenOffice can be downloaded www.openoffice.org for free. When you open a DBF file, OpenOffice will ask you to choose the Character Set for the DBF file, if you are using European language characters or any non-English characters, make sure that you select “Unicode (UTF-8)”. If you are only using English alphabetic characters, then you may choose either Unicode (UTF-8) or the default “Western Europe (DOS/OS2-850/International)”. Please note that when you edit the DBF file using OpenOffice, the first row contains field definitions and should not be modified. The maximum length of each field is indicated in the field definition. For example, in Companies.DBF, the field definition “FULLNAME, C, 40” indicates that the field is used for storing corporate names and its maximum length is 40 characters. FULLNAME – The company name. SHORTNAME – The short name for the company, which is displayed when there is insufficient space on the screen for displaying the full name. 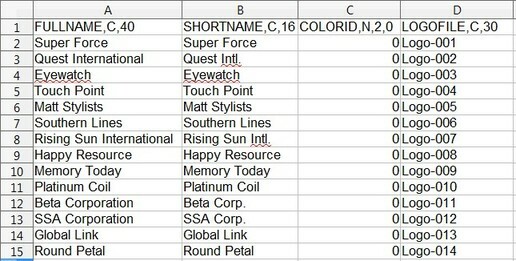 COLORID –If the value is 0, the company will not be tied to any specific color ID and its color ID will be randomly determined in each game. When you assign a value ranging from 1 to 11, corresponding the colors shown below, it will be the company’s default corporate color. LOGOFILE – the file name of the logo image for the company. To add new records, you may simply enter data on a new row. This file is used for defining logo files. It only contains one field as described below. LOGOFILE – The file name of the logo image, which must correspond to the logo image files in the “MOD\IMAGES” folder. CHARACTER – The person’s character. CODE – The product code. Please note that this code is used by the game engine to process the data and you are not allowed to modify it. NAME – The product’s original name. This is for reference only and you should not modify it. NEWNAME – Enter a new name here if you want to change the product’s name. NAME – the person’s name. You will find subfolders for modding images of logos, products and person portraits. It contains product images in PNG file format. To mod, simply replace an existing PNG file with a new one. The image size must be 120×120 pixels. It contains person portraits in PNG file format. To mod, simply replace an existing PNG file with a new one. The image size must be 60×64 pixels. There are two sizes for logo files – 60×60 pixels for the large size and 30×30 pixels for the small size. The large size logos are the ones you normally see on interfaces such as the corporations report. The small size ones are displayed next to firm buildings on the city map.The game allows the player to choose a logo from a variety of 11 different colors. Therefore, when you mod the logos, you should also create new logos in the same 11 colors, matching the existing ones. You will find subfolders with a numeric name such as “1”, “2” and so forth. The numeric name indicates the color ID of the logos in the subfolder. For example the folder “\Images\Logos\Small\2” contains small logo images for color ID #2. PACK.BAT – run this file to pack resource files in each subfolder under the “MOD Kit” folder into a single MOD file. PACKALL.BAT – run this file to pack ALL individual files in each subfolder under the “MOD Kit” folder into a single MOD file. CapMod.RES – The resulting MOD file generated by Build.BAT. 1. Run PACK.BAT or PACKALL.BAT to build the MOD file “CapMod.RES”. 2. Copy “CapMod.RES” to <Capitalism Lab folder>\MOD and rename it to a name you prefer. 3. Create a text file to accompany the MOD file. For example, if you have built and renamed MOD resource file from ”CapMod.RES” to “MyMod.RES”, you will have to create the text file “MyMod.TXT” in order for the game to read the MOD file. This specifies the DLC that this MOD requires. If the required DLC is not available, the game will refuse to load the MOD. 4. Create a banner for your MOD. The banner image should be in PNG file format. The size should be 750 x 125 pixels. The file name of the banner should be the same as the MOD file, with “.PNG” file extension. e.g. If your MOD file is called “MyMOD.RES”, then your MOD banner image file should be named as “MyMOD.PNG”.